Preheat oven to 200°F. Cover large rimmed baking sheet with paper towels and place in oven. In small bowl, combine sour cream, lime juice, lime zest, cilantro and salt to taste; set aside. Combine Cheddar, cream cheese, red onion and chile in food processor and pulse to make a paste; set aside. Spoon scant tablespoon Cheddar mixture onto each of 6 wrappers, moisten edges with water, fold wrapper over filling and press to firmly seal; repeat with remaining wonton wrappers. Pour oil into large, heavy stockpot to 1 inch deep and warm to 350°F over medium heat. Cook wontons in batches, turning occasionally, until browned, about 1 minute. Transfer to a plate, then to oven. 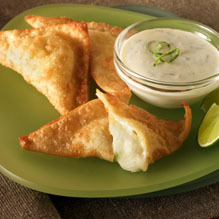 Serve wontons hot, with lime mixture on the side.